There has even been a significant shift in the last two years alone. 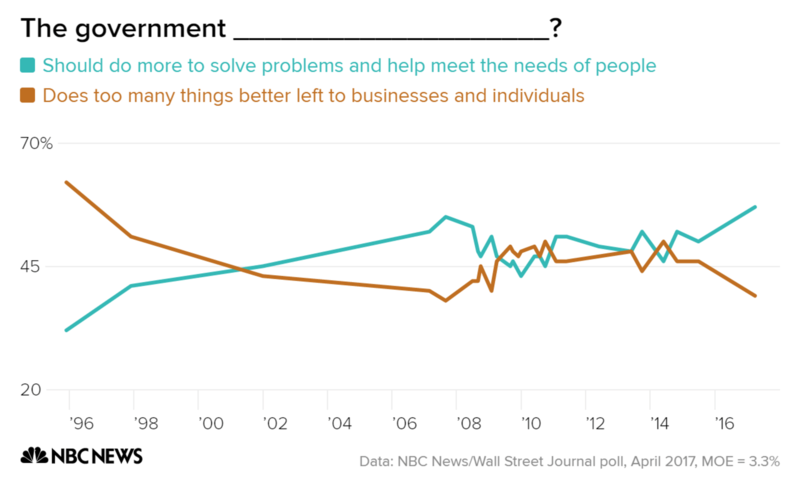 In 2015, 50 percent of voters thought the government should do more. Today that figure is 57 percent. 46 percent of those polled that year thought government did too much. That figure is now down to 39 percent. Contrary to conventional Democratic wisdom, this suggests that moving to the left may not lose these “persuadable” voters at all. They may be more responsive to a well-framed agenda based on an expanded role for government than they would to a ‘split the difference’ centrist approach — one that would also depress turnout among the Democratic base. There are several possible explanations for government’s growing popularity. First, a rising stock bubble during the 1990s led to an irrational dependence on the private sector to meet social needs. Then, as the Republican Party continued to veer sharply toward the right, most prominent Democratic politicians clung to their 90s-era ideological distance from the party’s New Deal orientation instead of making the case for government’s rightful role in society. The financial crisis of 2008 awakened many people to the risks posed by the private sector, and to the need for government services in the wreckage created by Wall Street greed. The Occupy movement triggered an important national dialogue about inequality and the increasing diversion of national wealth to a privileged and powerful few. The Bernie Sanders presidential campaign gave a political voice to this movement during the 2016 campaign. Even Donald Trump was forced to get into the game. He promised to repair American infrastructure and create millions of jobs, said he would renegotiate job-killing trade deals, and insisted that he would not cut Social Security or Medicare. The United States has fallen far behind other Western democracies on universal healthcare, and on other social programs like family and medical leave and affordable child care. The loss of low-cost or tuition-free public higher education, once available in states like New York and California, has fostered an exploding student debt crisis and a further loss of social mobility for lower-income and middle-class American families. The nation’s infrastructure is collapsing, leading the American Society of Civil Engineers to call for $2 trillion of investment over the next ten years. No wonder Americans want their government to do more. So much more needs to be done. And there are, in fact, many things the government does extremely well. Both Social Security and Medicare, for example, operate at much lower cost and with greater efficiency than comparable private-sector efforts. Another recent Washington Post-ABC poll found two-thirds of the American people (67 percent) think the Democratic Party is out of touch with most people’s everyday concerns. (Trump at 58 percent and the GOP at 62 percent are also in the doghouse on this one). One good way to fight that perception is by proposing smart, effective government initiatives to address those concerns. Most people are worried about making a decent living, getting the medical care they need, caring for a sick kid, educating their children for a better life… maybe even taking a family vacation once in a while. Helping them would be good politics, as well as good policy. Democrats like Minnesota’s Rep. Keith Ellison and Washington’s Rep. Pramila Jayapal view elected office from the perspective of activists and organizers. (I spoke with Rep. Jayapal about that here.) That suggests an intriguing path forward. It is an organizers’ truism that communities are best mobilized by finding issues that affect most people –garbage collection and snow removal are often used as examples at the local level – and building momentum around that. The federal government can be an effective tool for addressing many of the problems that affect people’s lives today. A party can be re-envisioned as a movement. Activist politicians for an activist government: it’s an approach more Democrats should consider.